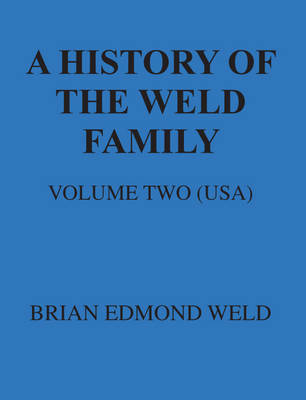 Many members of the Weld Family have been interested in researching the history and descent of our family over, at least, the last hundred and fifty years. It is, therefore, with some trepidation that I set out on this great task. My own interest in the family started while still a child and has occupied many thousands of hours of my spare time over the last 60 years. For convenience I have split the work into two separate volumes each with its separate index. The first volume deals with Great Britain and contains details of all the so-called British families although many of their branches finished scattered over the entire face of the globe. The second volume deals with North America and contains the details of the predominately English families who settled in the United States of America and to a lesser extent in Canada. Only a few of these families settled back in Europe or elsewhere in the world.